The Infinite and Eternal perfect wisdom of the Almighty is illustrated for mankind perhaps most beautifully on earth in the sacred Architectural principles governing the structure and dimensions of the Temple and Tabernacle of Israel. The manner in which the Creator set the symbolic mathematical and geometric structure of Israel’s Temple and Tabernacle to portray the order of His Creation, is a key element of this present study. A prime example of this includes the application of the Phi ratio in God’s Creation. This study endeavors to illustrate aspects of the application of the Phi ratio in the Temple and Tabernacle by the Almighty, and how Christ embodies these principles at the pinnacle of Creation. It is important to realize at the outset that as we study these appearances of the Phi ratio in the Word of God, their application as seen in Scripture far out weighs any application in Greek philosophy or history, or any human application of these principles for that matter, because the perspective of the All-powerful Omniscient Creator of Heaven and Earth, has purposes far beyond those of mortal man, as the Prophet Isaiah tells us. 7 Let the wicked forsake his way, and the unrighteous man his thoughts: and let him return unto the Lord, and he will have mercy upon him; and to our God, for he will abundantly pardon. 8 For my thoughts are not your thoughts, neither are your ways my ways, saith the Lord. 9 For as the heavens are higher than the earth, so are my ways higher than your ways, and my thoughts than your thoughts. 10 For as the rain cometh down, and the snow from heaven, and returneth not thither, but watereth the earth, and maketh it bring forth and bud, that it may give seed to the sower, and bread to the eater: 11 So shall my word be that goeth forth out of my mouth: it shall not return unto me void, but it shall accomplish that which I please, and it shall prosper in the thing whereto I sent it. The Science of God is not science for the sake of science itself, but as we study the application of scientific principles from the Hand of God, we can see how the Works of His Hands are manifested from His Spoken and Written Word. Many hold that the Bible is not a book of Science, yet where the Scriptures speak on Science and the Laws of Nature, they embody the inerrant perfect wisdom of God. Judaism practiced in Israel of the Old Testament had many feasts and sacrifices ordained in Scripture. These symbolic Old Testament sacrifices practiced in the Temple and Tabernacle were not just rituals without internal meaning, but ceremonies having true spiritual import. In this context, the Passover Lamb was a symbolic type of Christ, who embodied not only the benefits of the Old Covenant, but also the blessings of the New Testament, even those beyond in the third Heaven and Earth. The symbolism of the Temple and Tabernacle of Israel also provides a very strong case for the Intelligent Design principles utilized by God, in His temporal, physical and spiritual order of the Heavens and Earth. As the old order of Aaron’s priesthood was fulfilled in Jesus as the High Priest after the order of Melchizedek, God reveals His perfect society, with Christ Jesus as the Head of his Body-the Church. Since Jesus Christ is the perfect man, he embodies an inclusive relevance for the entire body, soul and spirit of man, [I Thess. 5:23]. Only the fool chooses to ignore the inherent harmonies found throughout the Natural World, portraying these truths from the Spiritual World. A goal of this study is to help the reader grasp the potency of the Godly symbolism in Israel’s Tabernacle and Temple. As our study progresses we will note an emphasis on divine celestial order, revealed at a time long before like knowledge was asserted by the ancient Greeks, Babylonians or Egyptians. 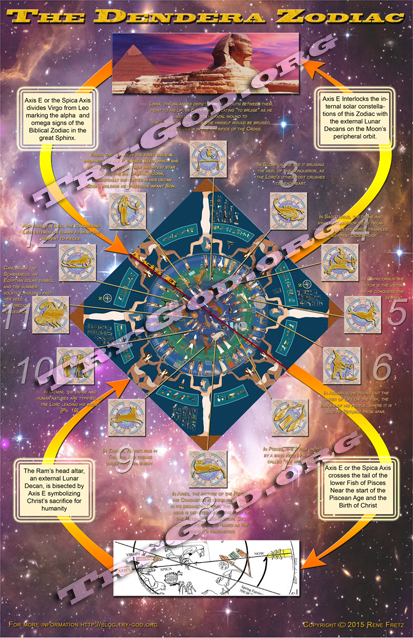 However, since the Creator was truly the source of the divine design of the Temple and Tabernacle, then we may expect to find unique symmetrical functions in their geometric order, related to kingdoms of life on multiple levels of God’s Creation. When we look to the witness of God’s Word we find these harmonies in their primary and divine context, as opposed to how these principles were applied later in mysticism, secular science, or cosmology. A basic pattern that emerges involves the plans for Israel’s Temple and Tabernacle as divine architectural expressions the gospel of the coming redeemer, written in the stars, serving as a sacred architectural fulcrum between the witness of the stars and God’s written Word. As we will see the divine patterns in the celestial structure are reflected on earthly levels in ultimately as they are embodied in Christ. Let’s begin by looking at a key application of the Phi ratio regarding the blueprints of the Temple and Tabernacle. In Exodus 25:8 God commands Moses to make a sanctuary for Him. 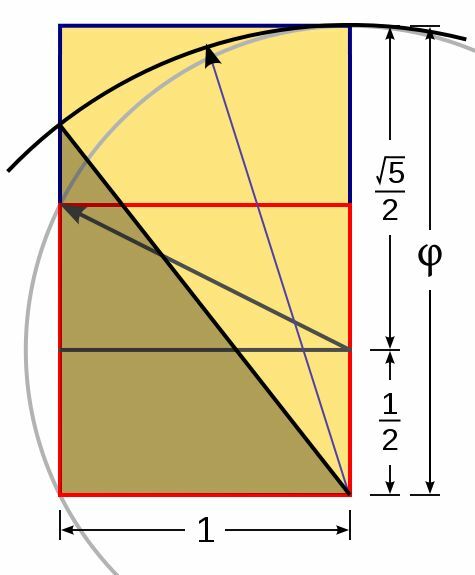 An example of the geometry for the 1 x 2 golden rectangle referred to above is seen below. Then you can extend the square to be a rectangle with the Golden Ratio. This rectangle above shows us a simple formula for the Golden Ratio. The square root of 5 is approximately 2.236068, so the Golden Ratio is approximately (1+2.236068)/2 = 3.236068/2 = 1.618034. 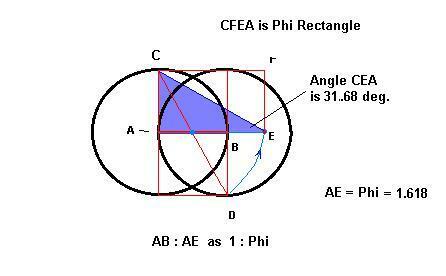 This is an easy way to calculate phi and related geometry we find in blueprints of the Temple and Tabernacle. 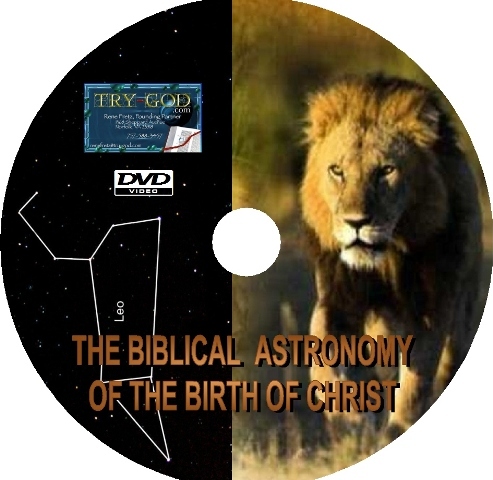 This is a key topic in our study of Biblical Astronomy principles evident in other studies on our [www.try-god.com] website, like The Calendar of the Biblical Patriarchs. This study points out among many other things that the cycles of the Sun and Moon are correlated via the phi ratio [1.618] in the 50-year Jubilee cycle, because there are 618 full moons every 50 solar years. This not only exhibits another phi relation in our solar system, but also links this divine knowledge to the Hebrew calendar as commanded in Levitcus 25. So, God has designed the phi ratio in our solar system, even as He has all the other phi/Fibonacci/ Lucas relations, throughout the Natural World, exhibiting the Creator’s symmetrical Intelligent Design across multi-levels of His Creation. The preponderance of the phi ratio through the Four Kingdoms of Life, is an awesome testimony to the Creator’s Temporal Order. This phi ratio, is arrived at by a scale invariant comparison. The relationship that becomes evident in this comparison is divine, because it is found throughout all levels of the Natural World, including the micro to the macro. In this comparison of the divine proportion, the whole is to the larger as the larger is to the smaller. This relationship is seen in Plate 1 above as the linear Phi ratio divided into the square root of 5/2 and 1/2. 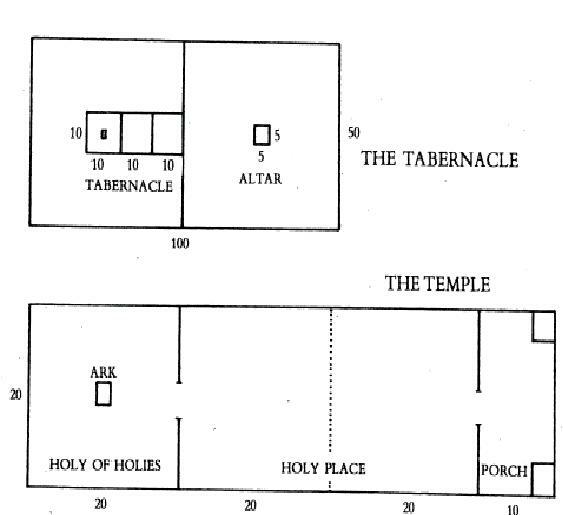 As we observe the appearance of the Phi ratio in the Temple and Tabernacle, we also find the examples of the two altars within the courts of the Temple/ Tabernacle pattern as a whole. This view powerfully depicts how the Temple and Tabernacle symbolized God’s celestial design of the heavens, seen in their two altars, mirroring the two poles of the ecliptic and the Celestial Equator. This also agrees with many of the principles seen in the pattern of God’s Intelligent Design inherent in His Creation. 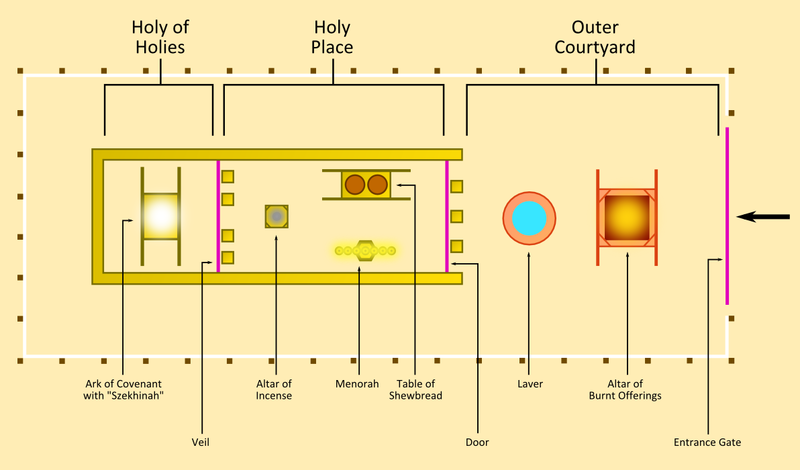 Since this God given “pattern of the Tabernacle” is constructed upon the phi ratio also known as the “divine proportion” or the golden section we find definitive Biblical evidence that this universally recognized standard of measure is truly divine in origin, since the dimensions of these sacred architectural structures were given by revelation from God to Moses and King David. By prioritizing a godly view of this evidence, it allows us to catch new glimpses of glories long hidden from the astrologers and empiricists, whose practices for too long have clouded the inherent grandeur of the Creator’s sacred architecture. The dynamic celestial equator, the second circle secular in nature, relates to both the civil calendar year and the earthly Equator as it is mirrored above into the heavens. The movement of this equatorial pole around the static pole of the ecliptic is what is known as the precession of the poles. The intersection points of the ecliptic and the Celestial Equator are called the equinoctial points, which we know as the Spring and Fall equinoxes, the days when the length of daylight is equal to the dark of night. The altar in the Holy of Holies, keeping the Ark of the Covenant is represented in the sacred pole of the ecliptic, around which the equatorial pole moves, both wheels, inter-locked in the form of a Venn Diagram, depicting God’s personal presence among His people. Exodus 25:10 “Have them make an ark[b] of acacia wood—two and a half cubits long, a cubit and a half wide, and a cubit and a half high. [c] 11 Overlay it with pure gold, both inside and out, and make a gold molding around it. 12 Cast four gold rings for it and fasten them to its four feet, with two rings on one side and two rings on the other. 13 Then make poles of acacia wood and overlay them with gold. 14 Insert the poles into the rings on the sides of the ark to carry it. 15 The poles are to remain in the rings of this ark; they are not to be removed. 16 Then put in the ark the tablets of the covenant law, which I will give you. 17 “Make an atonement cover of pure gold—two and a half cubits long and a cubit and a half wide. In Exodus 25:10, God commands Moses to build the Ark of the Covenant, in which to hold His Covenant with the Israel, the Ten Commandments. The measures of this Ark in the ratio of 2.5 to 1.5 is 1.666…, is a close rendition of phi (1.618). The Ark of the Covenant is thus constructed using the Golden Section, or Divine Proportion, and compares to the dimensions of Noah’s Ark [Gen. 6:15] also built in the same proportion as ten Arks of the Covenant along side each other. The measures of Noah’s Ark; 50 x 30 cubits, in breadth and height also a ratio of 5 to 3, or 1.666, is again the same approximation of the Phi ratio as the Ark of the Covenant. The ratio evident in both of these examples include numbers of the Fibonacci Series [1, 2, 3, 5, 8, 13…] where the two previous numbers in the series added together equal the third number. As this number series progresses, the higher numbers in the series converge in increasing levels of accuracy to the value of Phi 1.61803399… Thus the numbers 3 and 5 represent lower numbers in the series having a more general approximation to Phi. It is also notable that the phi ratio as seen in [Ex. 25:10], also appears in the King’s Chamber of the Great Pyramid. Once Israel became centered in Jerusalem, the Ark of the Covenant moved from the Tabernacle to the Temple because the Ark represented not only the personal presence of God among His people-Israel, but it was also an ordained location where God met and talked to His people [Ex. 25:22]. The truth that the Holy of the Holies was where God manifested His infinite, All powerful presence in Shekinah Glory, in a way that His people could comprehend, finds its pinnacle in Christ, who declared God on the level of the senses more fully than any ever or will ever be done. Here we find another reason why God would utilize the Phi ratio to open the way of access for His people through Christ-into His Presence. Idea of the location where God presented Himself to His people, like Mt. Sinai was corrupted in heathen religions to the concept of an Axis Mundi, or “center of the Earth,” where devotees communed with idol gods of world religions, like the Oracle at Delphi. But with the Creator’s blueprint of the two altars of the Ark of the Covenant and the brazen altar of burnt offering centered in the Holy Place and the Holy of the Holies, mirrored at the North pole in the two celestial poles of the ecliptic and Equator, reflecting also the terrestrial and magnetic poles of the Earth, we find this pattern verified on three levels on earth and in the heavens. 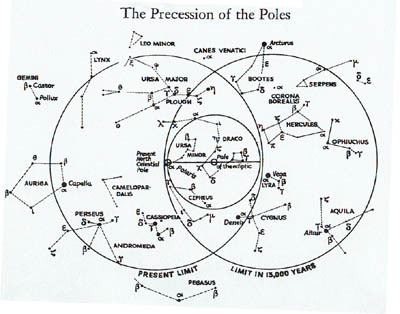 The celestial poles set the temporal standard on Earth as the terrestrial poles mirror their counterparts in the heavens. The two altars in the Temple/Tabernacle reflect the spiritual poles where the Almighty has made a way for man to meet and commune with his Maker. Lets now take a closer look at the outer Altar of burnt Offerings. In Exodus 27:1-2, And thou shalt make an altar of shittim wood, five cubits long, and five cubits broad; the altar shall be four-square: and the height thereof shall be three cubits. 2 And thou shalt make the horns of it upon the four corners thereof: his horns shall be of the same: and thou shalt overlay it with brass. As we can see the Altar of Burnt Offerings that God commanded Moses to build is based on a variation of the same numbers of 5 x 3 in the Fibonacci Series: an altar of acacia wood, three cubits high; it is to be square, five cubits long and five cubits wide.” It was the perfect sacrifice of Jesus Christ the pinnacle and perfection of Humanity, as the head of his spiritual body embodying all the ideals and sacrificial offerings in the Temple and Tabernacle in human form. When Christ laid down his life, his one time sacrifice paid the price for all humanity, and as the perfect High Priest Jesus embodied the atonement not only for Israel, but all mankind. In John 2:19 Jesus says to “destroy this temple,” while he stood in Herod’s Temple in Jerusalem. In effect Jesus’ contrasted the physical Temple wherein he stood, to his own physical body, the embodiment of the true temple. Jesus Christ, the 2nd Adam, is the consummate archetype, the finished model, and “chief cornerstone” not only for the nation of Israel as the Passover lamb and High Priest, but also for the Church of his spiritual Body, beginning at Pentecost after his resurrection and ascension. As the paragon of humanity, Jesus illustrated the highest standards of living spiritual principles in the prophetic illustrations of his life and ministry. Certainly, God did not record the symbolic dimensions of the design of the Tabernacle or the Jerusalem Temple, wherein Jesus stood when he spoke the words of John 2:19, without purpose. This perspective of John 2:19, depicts a prophecy of Jesus Christ in the Jerusalem Temple, representing this temple of stone and the bride of Israel in his physical body, that he laid down for Israel and all mankind in his crucifixion at Golgotha. Thus the plans of the Temple and Tabernacle are blueprints that Christ fulfilled in his ministry to Israel and all mankind. As we note the Phi Ratios in the structure of the human body, so we can see their pinnacle in Christ the head of the nation of Israel and the Church of Christian believers. 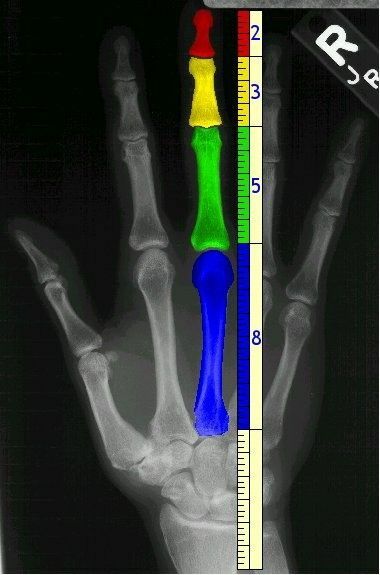 Thus it is with heightened interest that we point out the following ratios of the Phi proportion in the human body. Below we have two versions of Vitruvian Man, the first in Figure E, depicting the 17 various examples of Phi ratios in the human body. 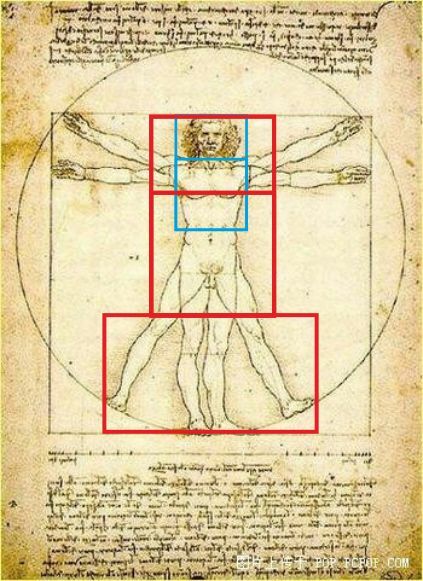 The Second in Figure F, shows the ideal man in relation to red and blue squares of the golden rectangle ground plans of the Temple and Tabernacle. The Third in Figure G depicts added examples of the Phi Ratio in the Human body. Figure E. Vitruvian Man a. Figure F. Vitruvian Man b. The human head forms a golden rectangle;. The mouth and nose are each placed at golden sections of the distance between the eyes and the bottom of the chin. This display shows the Intelligent Design of the human body by the Hand of the Almighty Creator in His Omniscient Wisdom. 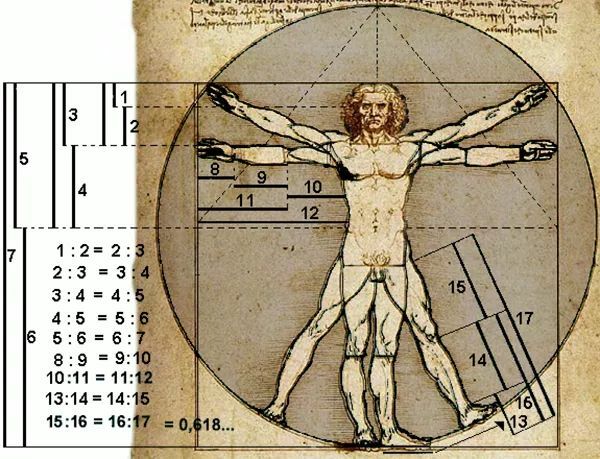 All these aspects of the Phi Ratio in the design of the human body work together to make the some greater than its parts, so that we can see why many consider the human body the pinnacle of Creation. God made the human body to house human life, in body, soul and spirit, first in Adam and Eve, and ultimately the only begotten Son of God-Jesus Christ. This brings us to the design of the genetic code of human Life, DNA, which is the Creator’s signature as the Life-Giver [John 5:6, 17:3] as seen in the Four Kingdoms of Life on Earth. Each cycle of the DNA molecule measures 34 angstoms long by 21 angstroms wide. 34 and 21 are Fibonacci numbers. The ratio of 34/21 is a more accurate approximation of phi, since it is further into the Fibonacci series than the previous examples of 3 and 5. Jean-claude Perez suggested there is a strong link between DNA and golden ratio in 1991, then later in 1997 in his book l’ADN décrypté. His work shows that relative proportions of nucleotides within coding DNA sequences like genes or RNA strings are governed by specific Fibonacci and Lucas number sets. This discovery was validated particularly on all known HIV and SIV (Simian Immunodeficiency Virus) retroviruses whole genomes with Professor Luc Montagnier (the discoverer of HIV virus) which called the discovery a “DNA supracode” . Stay tuned for Part 2 of the Biblical Astronomy of the Phi Ratio in the Temple/Tabernacle of Israel which is coming this way soon! 1. Sacred Geometry, Nigel Pennick ppg. 58-62. 4. Wikipedia on the Phi ratio in the Human Body and DNA.